We are enlisted among the leading Manufacturers, Exporters and Suppliers of Rubber Lined Split Clamp. Suitable for ceiling suspension or vertical wall mounting of piping, our Rubber Lined Split Clamp comes in wide assortment of variegated specifications. The Rubber Lined Split Clamp is fabricated using mild steel electro galvanized and sophisticated technology strictly in compliance with the set industry standards. The clamp features high quality rubber lining for suppression of sound and vibration. Further, Rubber Lined Split Clamp is made available are very competitive prices. High quality rubber lining for suppression of sound and vibration. Lips are provided with additional thread lengths by means of extended collared tap holes. For pipe size, OD 100 mm and above, welded side nuts have been provided. Suspension nuts have twin threads, M8, M10 for flexibility of installation. Side bolts have slotted cross head for ease of tightening. Pipe OD / Pipe size plus insulation thickness. 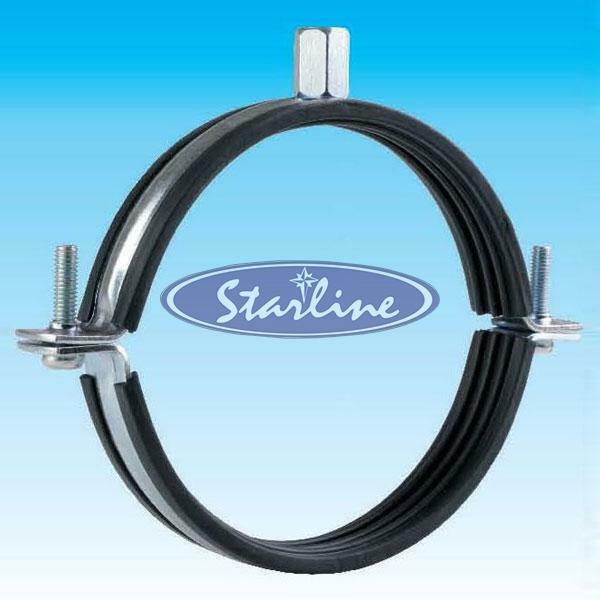 Indicate if starline rubber inserts are proposed to be used. (for automatic selection of clamp).